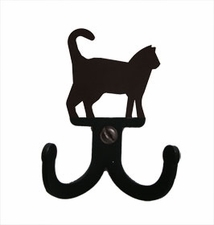 Approximate size: 2 1/4" W x 3" H x 7/8" D; Inside Hook Depth 3/8"
The double wall hook with a cat silhouette is handcrafted of wrought iron. It has a baked-on black satin matte powder coating to provide maximum moisture resistance for use both indoors and outdoors. This American made wrought iron double wall hook is handcrafted in Fabius, New York, by Village Wrought Iron.